Enjoy the carefree feeling of all day odor protection you can rely on. 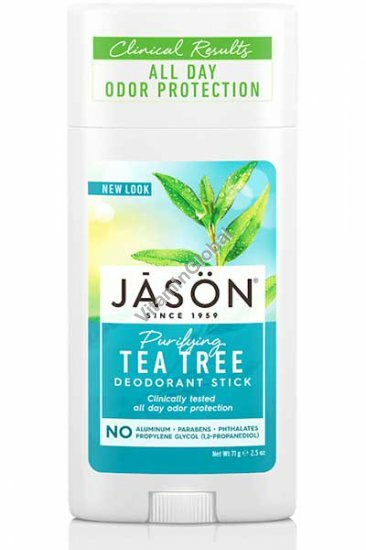 Clinically tested formula of Zinc Ricinoleate, Corn Starch and Baking Soda neutralizes odor, while Tea Tree Oil and Grapefruit Seed Extract, known for their antimicrobial properties, help fight odor-causing bacteria. Ingredients: Propanediol, Aqua (Water), Glycerin, Sodium Stearate, Zinc Ricinoleate, Polyglyceryl-3 Caprate, Melaleuca Alternifolia (Tea Tree) Leaf Oil, Citrus Grandis (Grapefruit) Seed Extract, Allantoin, Behenyl Alcohol, Ethylhexylglycerin, Glyceryl Stearate, Silica, Sodium Bicarbonate, Sucrose Cocoate, Tocopheryl Acetate, Zea Mays (Corn) Starch, Amyl Cinnamal, Benzyl Benzoate, Benzyl Salicylate, Citronellol, Isoeugenol, Fragrance (Parfum).Suggested Use: Apply to underarms only.